As a former research scientist, I want to make clear, there are no respected members of the scientific community that deny anthropogenic causes of climate change. Not a single one. Millions of scientists around the world interpret the objective scientific climate data the same. Their conclusion- man is the cause of global warming and only man can stop rising temperatures. The tiny handful of scientists who ‘claim’ global warming is not caused by humans are funded by fossil fuel companies to propagate a genre of fictional ablations to the general consensus of scientists everywhere. Brothers David and Charles Koch have an estimated combined net worth of nearly $84 billion. Their wealth was made primarily in tar sands oil (which has a 40% greater well-to-wheel carbon foot print than conventional oil). They are the largest financial sponsors of climate change denying scientists whose manipulation of data is so obvious it includes interchanging statistical mean and median (this sort of mistake would NEVER receive peer-review approval, meaning the climate change deniers are publishing in pseudo-scientific journals). The Koch brothers have long denied any connection to the Keystone XL pipeline, a claim as ironic as a climate change denying scientist filling his Escalade at an Exxon station while smoking a formaldehyde laden cigarette. 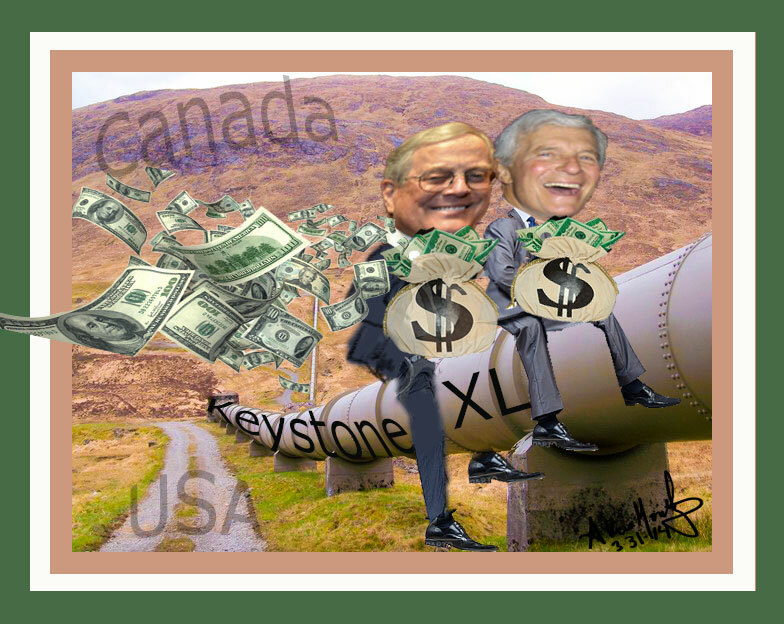 The fact is, the Koch’s are lobbying to ‘debunk’ science because approval of the Keystone XL pipeline will give them 25% of total Canadian tar sands oil imported to the U.S., a transaction worth $100 billion dollars. Making matters worse, the Koch’s claim that tapping the Canadian tar sands would decrease U.S. foreign energy dependence and boost the economy. However, the Keystone XL pipeline builder TransCanada, estimates the extensive extraction and chemical refining process will increase the price of oil from the Canadian tar sands $3 per barrel. The beauty of science is its replicable nature to verify the findings of prior studies. Over the last 100 years, studies on the causes of climate change have been reproduced using both historic and current data and the conclusion remains the same- global warming is man made. The corollary of these data remains the same as well- environmental protection agencies such as the EPA are essential to long-term survival of biodiversity and sustainability.